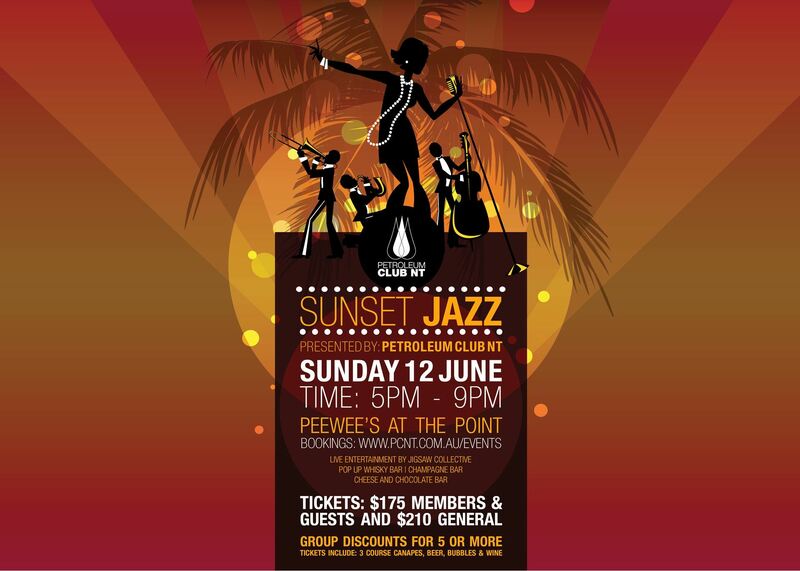 The inaugural SUNSET JAZZ annual fiesta will be held on Sunday 12 June, hosted by Petroleum Club NT. Setting the standards for high quality events in NT, this is not just another Darwin Gala Ball. We invite you to join us for a perfect sunset on the water with live entertainment from Jigsaw Collective – a well-known Swing Jazz, Contemporary Soul and Blues act known for it’s fun and funky live shows. This event welcomes our members and guests spanning professionals in the oil and gas industry across Australia. Partners are encouraged to attend this event to celebrate the last 12 months in the lead up to our first anniversary. It’s bound to be another perfect waterfront sunset at Pee Wee’s on the Point with exceptional food and drinks. Tickets include 3 course canapes with cheese and dessert bar and beer, bubbles,wine and soft drinks throughout the evening. Visit the dedicated pop up whiskey, bubbles and beer bars for a chance to win some great prizes! Dress code: Darwin Tropical Afternoon wear…casual, comfortable and classy.